Beijing, China – Chinese popular TV star Zhu Yawen and Olympic speed skating champion Wang Meng are attending a special sports advocacy event to show their support for gender equality. The advocacy event, which is organized by UN Women, Proya Cosmetic Company, Beijing Roller Derby, and seven other sponsors, is the International HeForShe Roller Derby Invitational. The event will attract a large audience of nearly 500 people to the Ditan Olympic Gymnasium in Beijing, China. The aim of this advocacy event is to raise awareness of UN Women’s global “HeForShe” campaign and China’s newly passed national law against family violence. This event will use the medium of sport to convey messages that women are strong, fast, agile, and should never be victimized. The featured sport is roller derby, a sport closely linked to women’s empowerment. Many honored guests will attend the event, including Mme. Xue Li, Deputy Director of Sports and Culture Development Center of the State Sports Administration; Anna-Karin, Deputy Regional Director of UN Women Asia-Pacific; and Julie Broussard, UN Women China Programme Manager. Mr. Yu Jia, distinguished CCTV5 host, will moderate the event. Ms. Deng Yaping, the world famous Olympic Table Tennis champion, will be as a special VIP Guest. To encourage more people around the world to support gender equality, UN Women has launched the global HeForShe campaign in September 2014. HeForShe is a solidarity movement for gender equality developed by UN Women to engage all people as advocates and agents of change for the achievement of gender equality and women’s rights. The campaign is encouraging people to speak out and take actions against inequalities faced by women and girls. Gender equality is not only a women’s issue, but it is also a human rights issue that affects everyone – women and girls, men and boys. Today’s event will feature a scrimmage between two “HeForShe” teams composed of a mix of roller derby players from Beijing, Bangkok, the UK, and Japan. Coaches and referees were from the USA and Canada. This event is marking the first time that a roller derby bout has ever been played in China. Proya Cosmetics Company, PricewaterhouseCoopers, Western Academy of Beijing, Women’s Flat Track Derby Association, Fella’s Catering Management Co., Ltd, Doko Healthy Food, Catering & Management Co., and Guangzhou Nice Court Flooring Co., Ltd are supporters of the event. To join this worldwide movement and make a commitment to make a change, pledge support to www.heforshe.org/zh and click “I Agree” to show your solidarity. To learn more about the program and track its progress, visit www.heforshe.org/zh or http://asiapacific.unwomen.org. 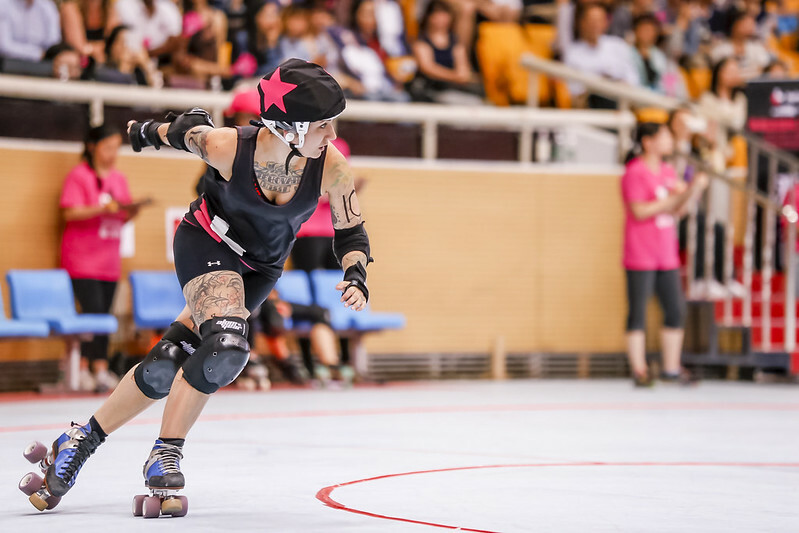 Formed in 2013, Beijing Roller Derby is one of three roller derby leagues in China. BRD was founded by UK transplant Jay Latarche and Texan Hooten Annie, who met online through a shared love of the sport. In the years since founding BRD, the league trained up a team of 20 -- mostly beginning-level -- skaters with bi-weekly training sessions and practice matches. Beijing Roller Derby wants to have a good time, play roller derby, and help promote the sport throughout China. Established in 2003, Proya is a Chinese leading Cosmetics research and manufacturer that applying high bio-technology to manufacture skin-care products. So far the company has successfully created 6 brands including PROYA, UZERO, ANYA, YOYA, CATS & ROSES and O’LAXSN with over 1000 products, able to satisfy the demands of consumers of different age and with different preferences; established nationwide distribution network across more than 30 cities, covering department stores, cosmetic boutiques, large supermarket chains and electronic business platforms. The company has successfully realized the multi-brand, multi-category, multi-channel and multi-model operation and development mechanism, achieving a leading position in the Chinese beauty market. Guangzhou Nice Court flooring Co. Ltd. is a leading global manufacturer of synthetic materials for sports and recreation flooring in China, established in 2004. They have set clear corporate goals, i.e. be the most professional provider of sports and recreation flooring, along with providing their customers with advanced technologies and products. They have been chosen as the designated sports flooring products by the organizers of professional sporting events both at home and abroad and claim to be Asia's largest manufacturer of Suspended Modular Sports Floor. The Women’s Flat Track Derby Association is the international governing body for the sport of women’s flat track roller derby and a membership organization for leagues to collaborate and network. The WFTDA sets standards for rules, seasons, and safety, and determines guidelines for the national and international athletic competitions of member leagues. There are currently 369 WFTDA member leagues and 76 leagues in the WFTDA Apprentice program. PricewaterhouseCoopers (known as PwC) is a multinational professional services network headquartered in London, United Kingdom. It is the largest professional services firm in the world, and is one of the Big Four auditors, along with Deloitte, EY and KPMG. As of 2015, PwC is the 6th-largest privately owned organization in the United States. PwC is a network of firms in 157 countries, 756 locations, with more than 208,100 people. The company's global revenues were $35.4 billion in FY 2015, of which $15.2 billion was generated by its Assurance practice, $8.9 billion by its Tax practice and $11.3 billion by its Advisory practice. Western Academy of Beijing (WAB), founded in 1994, is private non-enterprise not-for-profit organization belonging to the WAB Foundation and overseen by an all-volunteer Board of Trustees, incorporated in Beijing, China. It is schooling 1400 students from various countries from elementary school to high school level. WAB demonstrates its moral commitment through its philanthropic involvement and strong community ties. They run initiatives, such as the construction of an environmental center to teach students about eco-friendly environmental technologies. Fella’s Catering Management Co. is a family-style sports restaurant based in the Beigao community of Beijing that offers food catering for a variety of clients and occasions, including community events, international schools, private events, BBQs, etc. The company is a supporter of Sports Beijing, the Beijing Softball League, the Beijing Baseball League, the Beijing Ice Hockey League, and the Beijing Roller Derby League. They also provide direct sponsorship to the Western All Stars (baseball team), the Beijing Roller Derby, and all the teams in the Beijing International Ice Hockey League. Doko is a subsidiary under parent company Fella’s Food & Management LLC, a wholly foreign-owned enterprise (WFOE) in Beijing. A Beijing-based restaurant providing healthy meals, Doko aims at offering people quick, nutritious and delicious dining options and promotes a healthy diet. Their choices of meat, tofu and sauces are based on healthy principles. Besides that, in order to promote a healthy lifestyle, all beverages are non-alcoholic.